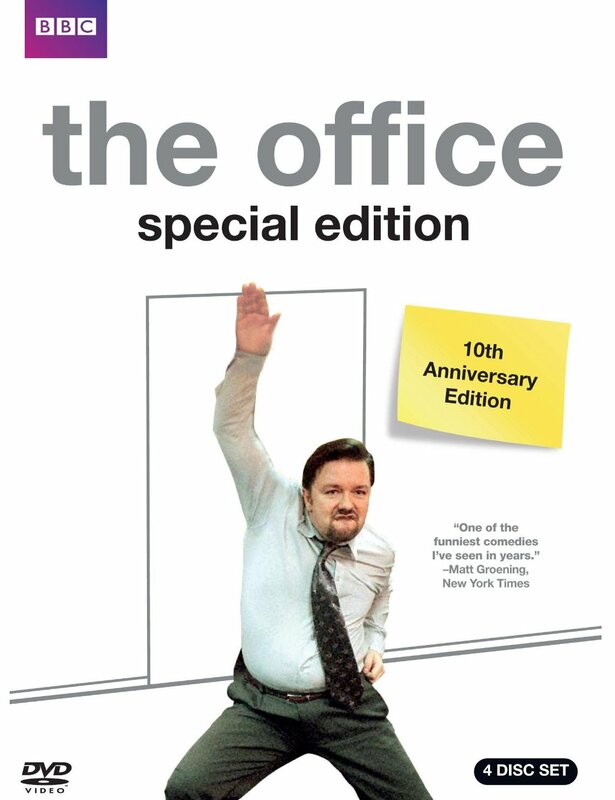 This holiday season celebrate with The Office Collection Special Edition available on November 22. 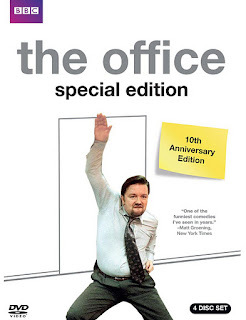 Written and created by Golden Globe winners Ricky Gervais and Stephen Merchant, the DVD Special Edition features the complete, original UK series plus all new bonus features. BBC AMERICA first introduced U.S. audiences to the comedy genius of Ricky and Stephen when it premiered the show in 2003. At its launch The New York Times called it “pretty much the funniest show ever” while Newsweek declared it the “best comedy on television.” It went on to win two Golden Globes, inspire the U.S. version on NBC and continues to influence the tone and look of everything from television comedy and movies to commercials and pop culture at large. · Interviews with the original cast including Ricky, Stephen, Lucy Davies, Mackenzie Crook, Martin Freeman and Ewen Macintosh as well as celebrity fans Ben Stiller, Christopher Guest, Matthew Perry, Richard Curtis and David Baddiel. Ricky Gervais shines as slimy, clueless boss David Brent in the "docusoap" series The Office. The premise of the show is that a documentary film crew is recording the daily goings-on of the paper company Wernham Hogg in lovely industrial Slough. The title credits show a gray, boring, office in the middle of a gray, boring town. David Brent is the Managing Director of the company, but he never seems to do much work beyond annoying employees and making them feel uncomfortable. He is never shy about addressing the viewer directly and imparting his vast wisdom on how to motivate employees to get the best out of them, while at the same time lightening the mood all round by being an "entertainer." The David Brent character does become a more sympathetic character as the series evolves and his odd behavior catches up to him. This Special Edition collection of the program consists of 4 disks which include both seasons of the series, as well as the series finale, a 2-part Christmas episode shown in 2003. One disk contains the original pilot episode, with actors who didn't continue on to the main series. It is interesting to see David Brent in all his original glory, when the principle actors had no idea that this project would evolve into a series! This disk also includes an interesting documentary with an interview with creators Ricky Gervais and Stephen Merchant discussing how the program came to be, and how unenthused the-powers-that-be at the BBC were at the beginning. The first season's episodes are all introduced by Stephen Merchant and Ricky Gervais discussing various aspects of the show, illustrated by clips from the series. The very first episode also features short clips of various well-known actors, including Ben Stiller, Christopher Guest and Matthew Perry discussing their admiration for the innovative and influential show. It was a little difficult for me at times to figure out when the reminiscences had ended and the actual episode began, though! Some of the other actors who appear in the series have also become famous since the airing of the show. Martin Freeman (Dr. Watson and soon to be Bilbo Baggins) plays Tim, who seems to be the only person interested in doing any actual work at Wernham Hogg. He is constantly thwarted in his efforts to concentrate by his annoying cubicle-mate (although they are unfortunately missing the walls which might have made the situation bearable) Gareth, played by Mackenzie Crook, best know for his role as a somewhat ramshackle pirate in the Pirates of the Caribbean films. The other main character is the receptionist Dawn, who is part of a love-triangle between the mild-mannered Tim and her tough boyfriend Lee. Lucy Davis (known for coaching her fellow survivors on how to play zombie in Shaun of the Dead) plays the conflicted Dawn. The disk containing the final episodes of the series also contains the documentary Closed for Business, where Gervais and Merchant and the various actors discuss why they decided to end the show at that point. The Christmas episodes were intended to be the series finale, so there are no cliffhangers that never get resolved or other annoying plot holes. New and old fans will enjoy this full series of the iconic British series. Fans of the American version of The Office will enjoy seeing where it all began! On a side note, I was very pleased to note the Eastenders reference in the first episode (Rickaaay!). Just one iconic show paying tribute to another! Disclaimer: I was provided a review copy of The Office Collection Special Edition by BBC.